If you have seen my past Auditory Memory packets, you will love this one! I am starting a series of seasonal themed auditory memory packets. The first one in this series is Auditory Summer. 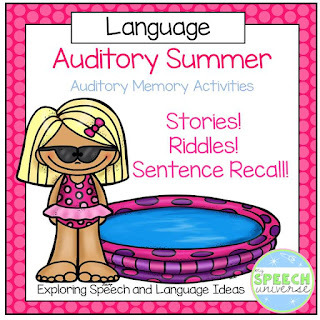 The first activity in this packet is Auditory Memory for Sentences. In this activity, you will pick a card for your student and read the sentence out loud. The student repeats the sentence exactly as you say it. There are 6, 7, 8, and 10 syllable sentences contained on these cards. 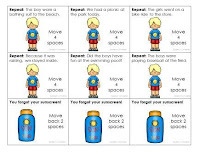 After your student repeats the sentence, they can move their piece on the game board provided. I printed my game board on an 11x17 piece of paper and laminated it. 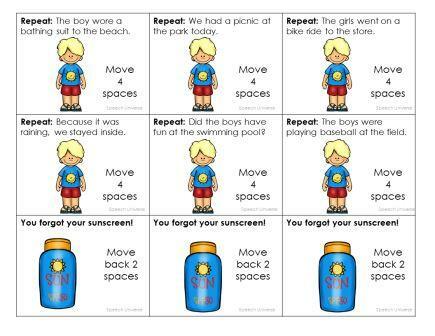 All of my students see it out on the table and want to play! 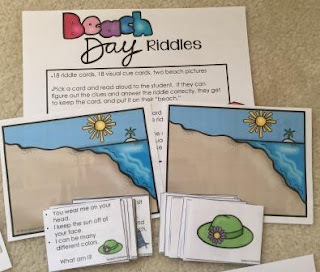 The second activity in this packet is Beach Day Riddles. 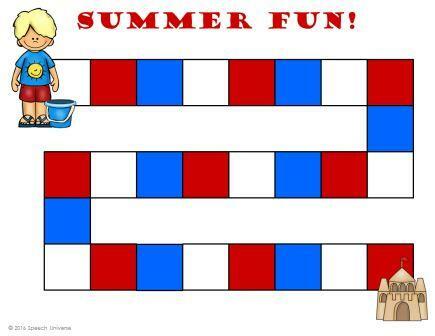 In this activity, students are given three auditory clues to name a summer item. The clues are read out loud. 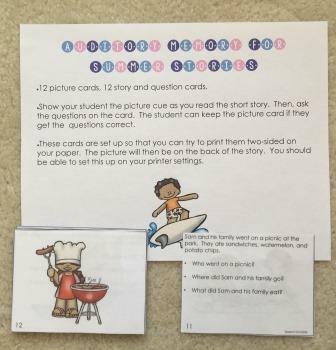 I have also included item picture cards that can be placed out on the table if the student needs some visual cues to guess the item. When the student guesses the item, they can put the item onto their "beach." The next activity Auditory Memory for Summer Stories. 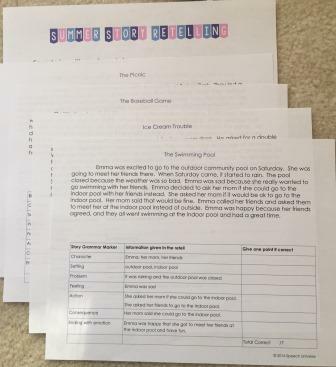 This is a set of super short stories with auditory comprehension questions. The questions target who, what, where, when, and some quantities. Each story has a picture that can be printed on the front of the card. I use the two sided print option on my printer and flipped the page on the left side in order to get the cards to line up correctly. 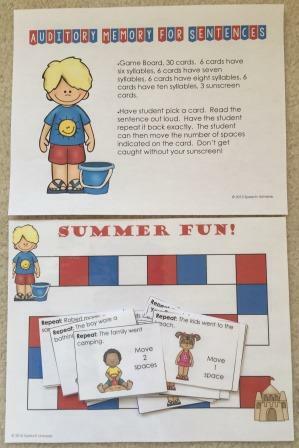 The last activity in this packet is Summer Story Retelling. In this activity, you will read a summer themed story to your student and then have the student tell the story back to you. A rubric is contained at the bottom of the page so that you can easily keep data on story retelling. My students have already been having fun with these auditory activities. You can purchase this for your students here: Auditory Summer. Speechy TPT Teacher Appreciation Sale!